The Grundig G1100B is the perfect travel companion, keeping you in touch with both local and international news where ever you go. 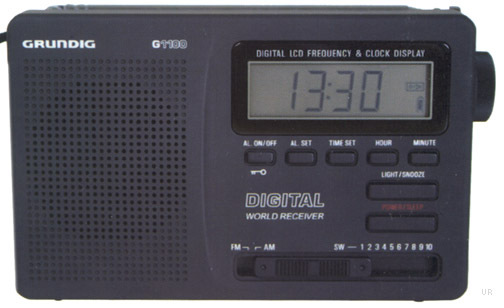 This compact radio receives AM, FM and ten shortwave bands. 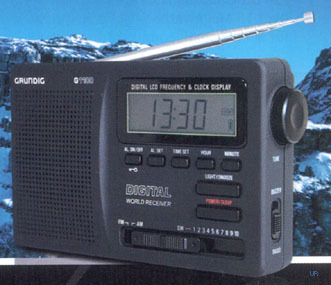 Shortwave coverage is: 3990-4440, 4680-5260, 5920-6610, 7015-7730, 9160-10130, 11590-12500, 13530-14200, 15060-16000, 17380-18200 and 21560-22140 kHz. The G1100 is easy to use with an analog tuning knob on the right side of the radio. It features a digital display, lock function, radio or buzzer alarm, 24 hour clock, sleep function and stereo headphone jack. Comes with a protective pouch, two AA cells, stereo ear buds and wrist strap. There is a wall adapter jack 3VDC [] 100 ma (wall adapter not included). Black rubberized case 5.12 x 3.15 x 1.15 inches 7 oz.